Lori Myers hails from Upstate New York, in the Adirondack region. She has written for the "Schenectady Gazette" and began writing professionally in 1995. She is a certified personal trainer and is currently expanding her education in computer programming. Myers obtained her bachelor's degree in journalism and her master's degree in nutrition from Syracuse University. The stomach flu, also known as viral gastroenteritis, is a condition that everybody has dealt with at one time or another. It is a stomach ache accompanied by such symptoms as nausea, vomiting, diarrhea or fever. Many germs can cause the stomach flu, but rarely is it caused by bacteria or other microbes. People who suffer with the stomach flu usually get better within one to six days with the right home treatment. When the stomach flu first hits, it is best to rest the stomach and intestines. It is best to avoid food altogether and just drink clear liquids. The choice of fluids is important; if water is the only liquid that can be tolerated without vomiting, that is OK. If you are vomiting frequently for a long time, you must be sure to replace the minerals, potassium and sodium that is lost. Ask your doctor for her recommendations on sports drinks or medical products that might help replenish what has been lost. Weak tea or apple juice can also be drunk or soft drinks that do not have caffeine, making sure to let some of the carbonation out of these sodas. Keeping these drinks chilled may help to keep them down. Avoid acidic drinks such as orange juice or drinks containing caffeine, such as coffee, or any beverage that has a lot of carbonation. Do not drink milk until after the diarrhea has gone. When you find that drinks can be tolerated without vomiting for several hours, you can then start eating bland foods. The best known bland diet is referred to as the BRAT diet. BRAT stands for bananas, rice, applesauce and toast. The BRAT diet contains foods that are binding, which means they are low-fiber foods that can help firm up your stool, states the Family Doctor. 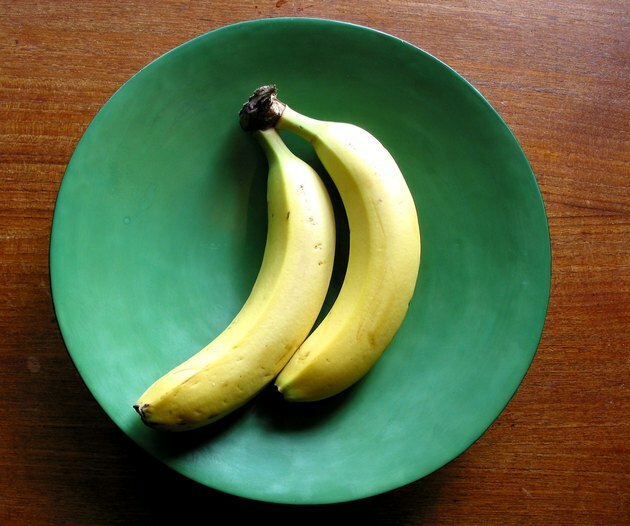 The bananas are good for replacing the potassium that has been lost due to the vomiting and diarrhea. Other bland foods that can be added include plain mashed potatoes, yogurt, pudding, soda crackers and noodles. Avoid foods that are spicy, acidic, fibrous or fatty, such as meats, course grains, vegetables and dairy. If eating is well-tolerated for a day or so, you may advance to a full diet. When infants and children are afflicted with the stomach flu, it is very important to maintain proper hydration and to not try and force feed them. Start with small sips of fluids; depending on age, you can begin with a teaspoon or a tablespoon or 1 to 2 oz. of an oral rehydration solution or clear broth. Ice pops and gelatin may also be given to the child, but if he vomits, wait a little while and try again. If the child is breastfeeding, continue to do so, but if not, avoid cow's milk. You may become dehydrated because of excessive vomiting and diarrhea. If this happens, you may need to receive intravenous fluids. In children and the elderly, dehydration may quickly turn life-threatening. Symptoms of dehydration include excessive thirst, dry mouth, dark yellow or little to no urine, severe weakness or lethargy, dizziness or lightheadedness, and decreased tears. If you continue to have severe symptoms for more than two to three days, if minor symptoms, such as loss of appetite, nausea or diarrhea, persist for several days, or if you develop symptoms that are not caused by the stomach flu, such as bloody diarrhea or blood in the vomit, call your doctor immediately. Should Kids With an Upset Stomach Drink Milk? What Should You Eat When You Have Salmonella? After Vomiting Should I Drink a Lot of Water?